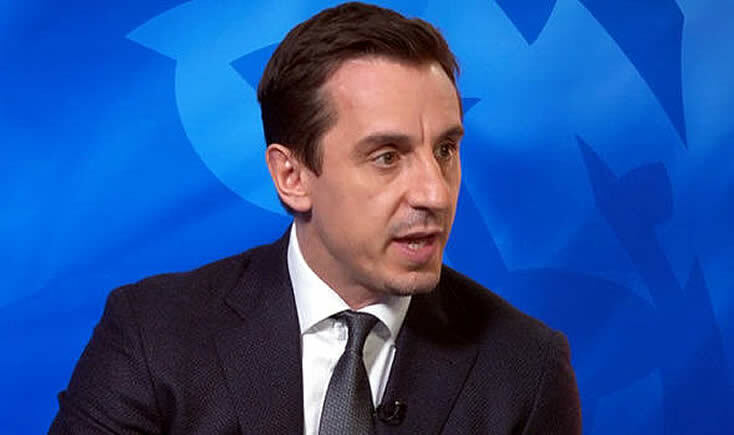 Gary Neville has expressed his surprise at Manchester United’s inefficiency in a 3-2 comeback win over Crystal Palace at Selhurst Park on Monday night. The Red Devils struggled in the first half after former Tottenham Hotspur winger Andros Townsend broke the deadlock with a deflected strike. Palace extended their lead shortly after half-time through Patrick van Aanholt to leave Manchester United on the brink of successive away defeats. However, Jose Mourinho’s side halved the deficit through Chris Smalling before Romelu Lukaku levelled the game from close range. Manchester United completed their comeback in added time when Nemanja Matic netted a long-range volley. The Red Devils hoisted themselves above Liverpool FC into second place in the Premier League table ahead of their meeting at Old Trafford on Saturday afternoon. Former Manchester United defender Neville believes the Red Devils were startling inefficient at Selhurst Park which will worry Mourinho. “I’ve never seen a Jose Mourinho team as inefficient as this,” Neville told Monday Night Football on Sky Sports. “They’re usually efficient teams, they do things really calmly and are usually solid in defence. They get the ball forward. He won’t recognise this. Manchester United will take on La Liga side Sevilla in the second leg of their Champions League last-16 clash next week after a goalless draw with the Spanish side. The Red Devils signed Chile international Alexis Sanchez in a swap deal from bitter rivals Arsenal in the January transfer window.